In 2015, we published results from our first Learner Outcomes Survey in the Harvard Business Review in collaboration with researchers from the University of Pennsylvania and the University of Washington. The 2015 survey revealed that people around the world were benefitting from online learning in a number of ways, from starting a new career to gaining credit towards a degree. To hold ourselves accountable for building upon this favorable impact, we made the Learner Outcomes Survey a permanent part of our platform experience: every learner, anywhere in the world, who completes a course now receives a survey a few months later. And since a lot has changed on Coursera since 2015 – we’ve gone from 90 active courses on our platform to 2,000, and more than doubled the size of our learner community – we decided it was time for another deep dive into the data. 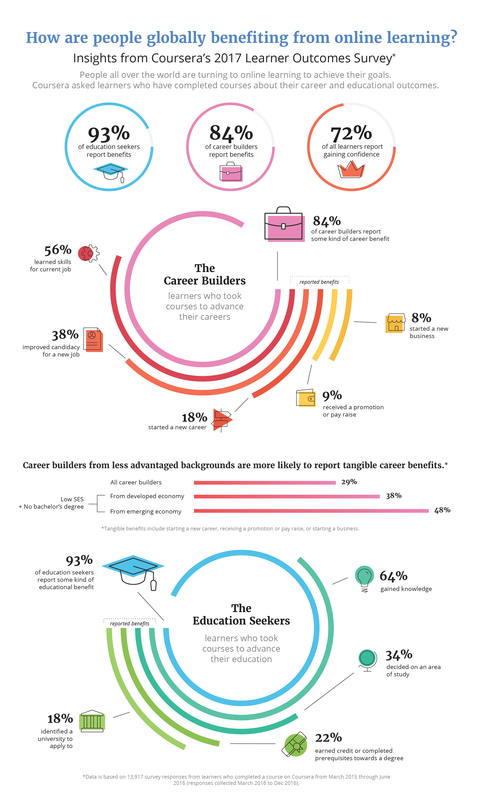 Career and educational benefits remain high: 84 percent of career-focused learners who completed courses reported career benefits; and among education seekers, 93 percent reported educational benefits. These numbers remain consistent with the survey results we reported in 2015. Many also report personal benefits: To better understand the less-tangible but still valuable benefits of completing an online course, we’ve added new questions about personal growth to our survey. Our recent analysis found that 72 percent of learners who completed a course reported gaining confidence, and nearly 50 percent reported benefits from connecting with peers around the world. Less-advantaged learners benefit more: Learners seeking career and educational advancement were more likely to report benefits if they came from developing economies, hadn’t completed a bachelor’s degree, or were of lower socioeconomic status. These outcomes speak to the progress we’ve made as a company in the past two years, and to the amazing work that our partner institutions, instructors, and course teams have done to make their courses available on our platform. And, of course, they speak to the dedication and enthusiasm that you, our learners, bring to Coursera. We continue to be inspired every day by your accomplishments, and we remain committed to working with our partners to bring you the skills and knowledge you need to achieve your goals throughout your lives. See the infographic below for more findings from the 2017 Learner Outcomes Survey or download it here.